When? Where? How much? If you are asking yourself these questions, you are on the right page. Tickets, opening hours, guided tours… here you will find everything you need to know to enjoy your experience to the full. Who can buy this ticket? Affiliated categories, promotional coupons and visitors of Museo della Giostra di Bergantino. Children up to the age of 5; the disabled with 1 carer; journalists with press passes; tourist guides with license. Another reason to visit the exhibition Art and Magic. Check out our special agreements entitling you to concession tickets. Lifts, mobile ramps and wheelchairs. If you have a physical disability you can reach the main entrance to the exhibition autonomously. If you need assistance, the entrance is constantly attended by our staff during opening hours; they’ll be happy to welcome you and facilitate your visit, enabling you to explore every exhibition space and reach the restrooms with ease. We have two priorities: to protect our art and make your experience with us unique. 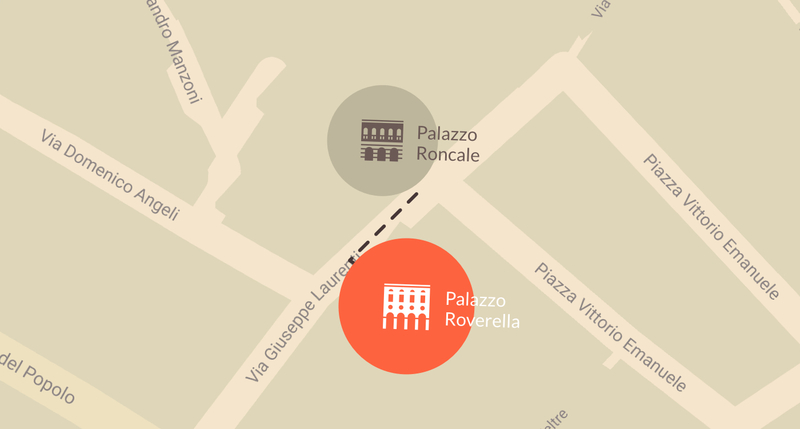 Our spaces are located opposite each other in the centre of Rovigo. We’re just a 15 minute walk away from the railway station. Take Viale Guglielmo Marconi, turn right into Viale Regina Margherita, then continue straight along Via Umberto I and Via Angeli. Take the Rovigo exit if you are coming from Bologna or the Boara Pisani exit if you are coming from Padua (motorway A13). If you are coming from Verona, instead, take the “Transpolesana” (state road SS 434). In all cases, follow the directions for the city centre. You can park in Rovigo’s multi-storey car park, situated 600 metres away from Palazzo Roverella, in Piazzale Giuseppe Di Vittorio. We invent something special (almost) every day. Why does the Foundation use personal data?